The Ultimate Fountain Fill macro. -Sample single or multiple fountain fills. Easily work with colors in fast and simple ways! -Add colors to fountain fills, even many at once! -Change fountain fill type with a click, even on all selected shapes at once! -Change Starting or Ending XY coordinates via a simple mouse click on the page. Coordinates take the mouse click position and change in all selected items, Nice effects! -Flip invert reverse fountain fill colors! -Evenly distribute colors in all fountain fills in all items selected, at once! -Copy sampled fountain fill to all selected shapes. -Complete WOW and the first of it's kind, RANDOM Fountain Fill generator. Works on all selected shapes at once. A huge powerful macro in itself! -Change fountain fills steps easily in all selected shapes, live and on the fly! -Change fountain fills angle easily in all selected shapes, live and on the fly! -Change fountain fills edge pad easily in all selected shapes, live and on the fly! 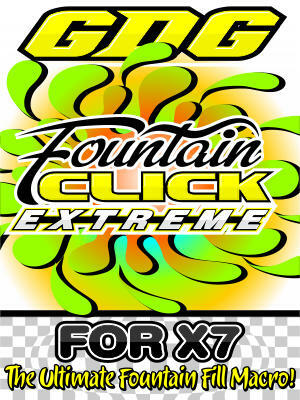 -Save fountain fills as presets for later use! -Improved Random Fountain Fill macro, plus adds random transparencies. -Improved Flip / Reverse Fountains colors, supports transparencies. -Added batch Skew and Blend Acceleration. Plus more improvements! -Improved ability to even fountain fill colors, adds features. An alternative to Draw's fountain fill controls, plus ability to batch work with features regarding fountain fills. Really the must have macro for those who use fountain fills a lot. This version is for X7 only.